I live on a 100 year old farm that no longer produces anything but the calm land on which my home sits. Our family surrounds us in quiet homes along a road we sometimes feel like we’re the only inhabitants of. We share a barn, which has little room for new treasures because it holds so much…dare I say junk history. Limiting myself to only what I could find in that beloved barn, this particular editorial was one that began on a whim one afternoon and ended up making me feel like a bit of an alchemist. Of course, my art shoots always begin with the invitation. 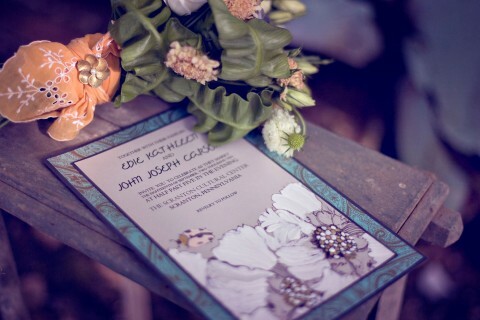 Here the Bold Botanical Wedding Invitations featured oversized versions of various herbs, feathers and one of my favorite blooms, the white Scabiosa.